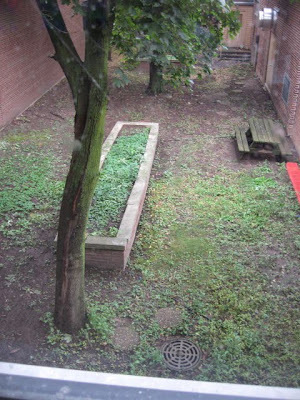 Our school atrium is in need of some serious help. 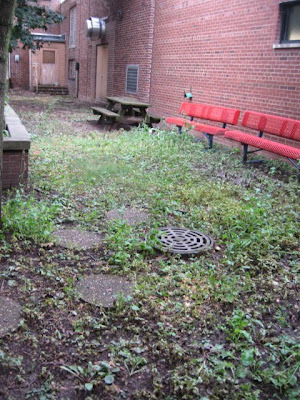 It's overgrown with weeds and is severely neglected. I have tried applying for a grant to help redo the area, but my effort was turned down. I've even thought about doing a little renegade gardening, coming in at night with plants from my own garden (but I think they would know who did it). 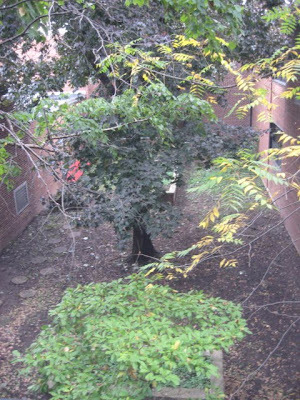 Our maintenance department is planning on cutting down the big trees in the atrium, because they are growing into the foundation of the school building. I would love for this area to be a quiet reading area for students in the spring and fall. It can't really be a outdoor classroom, because there are indoor classrooms surrounding the atrium and the noise echoes loudly inside the atrium. Since the atrium would only be seen in spring and again in late summer/fall I would love it to be full of spring blooming bulbs and fall blooming plants. They would have to be easy to take care of and a little drought tolerant, since we can't always guarantee things would get watered in the summer while students and teachers are away. I, of course, would love to put hostas and hardy geraniums in the area. 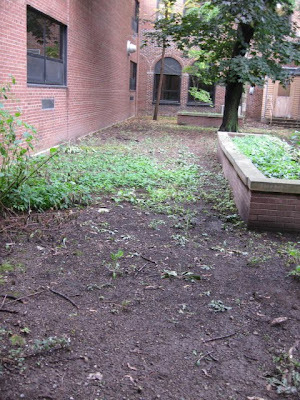 If we can find a way to use this area for a green project (such as teaching students to compost) there is a great chance we could receive a grant from the SCA company across the street from our school. I know there are a ton of great garden designers and gardeners out there, especially in the Twitter world, and I would love to get your opinions of what we can do with this space. It breaks my heart to see it in such disarray, when I know it could be such a beautiful space. 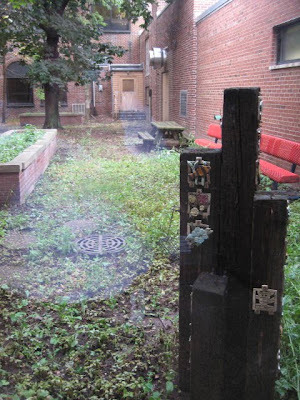 I think you should have a gravel walkway that winds around the atrium with a couple little sitting areas with fun little garden sculptures placed around the garden instead of a lot of plants - I think you'd be surprised how many parents would love to get rid of a piece of fun yard art. Kids always love that stuff more than adults anyway. Plant a grouping of hardy grasses in the brick planter so it breaks up the garden a bit - kids are scared of bees so maybe something that doesn't attract. Then plant a couple large bushes in opposite corners and fill in the rest with hostas and art. In short, do a little cleanup, add a few big plants and a few small plants, add a walkway, add seating and put in a lot of art. In the future you could even have a library writing contest to name each piece of art in the garden - or they could write stories about the pieces. I think Angela has great ideas. I was also thinking of rock paths and stepping stones. I think a compost area is a great idea. Maybe in spring do herb gardens and other easy veggies. I bet parents would volunteer their time and money to help out with this project. have a plant and seedling sale to earn funds for reading garden area. Lots of garden art and some bird feeders! Did you photograph two ghosts? Tell me I'm not the only one that sees those two "cloud" looking things in the photo. You got ghosts at the school. I have ideas all over the place but I'm stuck on sun/shade when it comes to plant ideas. Can you elaborate on where sun & shade is? I visualize a couple burning bushes in there to play off the red benches in the fall...but you need some sun for the red to appear. More info please!! !